Richard MacManus calls for a moritorium on defining Web 2.0™. Maybe we could go further. It's just a scam by some VCs to get "user generated content" to generate bubble money for them. It's pretty gross of them to try to hijack the 2WW this way, but I sort of understand why. What I don't get is why we support them. Most of the rest of us aren't going to be invited to ride their gravy train. Imho, the web is a platform for idealism. It's not a conversation, it's not a business model, it's so big it's basically everything having to do with human knowledge and communication, at least for the forseeable future. Let them have Web 2.0™, it's not important. What is important is that the users are running the show, and if you want to get behind that, be a user, and leave it at that. BTW, if the VCs don't like this, they can distance themselves from the scam. It's PR 101. They're always telling us how they're so smart about business, but the smart thing now would be to show the discipline needed to build real businesses that make customers happy. Some of your colleagues are trying to profit from self-induced irrational exuberance. Make it clear you're not one of them. TechCrunch: "The inevitable is starting to happen -- a few new web startups are starting to close up shop as they find that building an application is a lot easier than getting users to try it out." Dowbrigade: It's all Dave Winer's Fault. Seth Godin: Why I don't have comments. Bravo, amen. 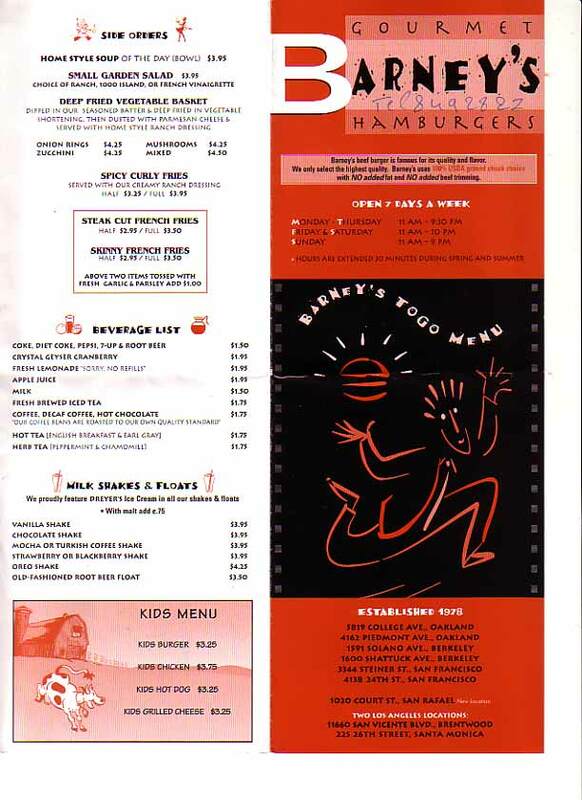 Barney's Gourmet Burgers, highly recommended burgers, fries, salads, shakes. Yummy! New header graphic, a sunny game at AT&T Park in SF. Interesting thread at Don Park's on Web 2.0 trademarks. About once a week a bunch of other tech bloggers, including yours truly, get an email from "TheoDP." I don't know who he or she is, but the emails are consistently anti-patent. Recently he's been sending email bulletins about the bang-up in the blogosphere over the "Web 2.0" trademark. The following was written by TheoDP, who I've encouraged to get a blog, so far without success. "On the same day Tim O'Reilly publicly pooh-poohed the legal fears of the target of a CMP cease-and-desist letter, CMP quietly appointed an L.A. Super Lawyer - one of 'World's Leading Trademark Practitioners' -- to handle the controversial Web 2.0 trademark." Last update: Sunday, June 04, 2006 at 10:05 PM Eastern.